Pew Internet: Parents who have minor children at home are a relatively tech-savvy group. They are more likely than other adults to have computers, internet access, smartphones, and tablet computers. (This relatively high tech use may be due to the fact that parents with minor children living at home tend to also be younger than other adults.) They are also more likely than adults without children to read e-books. But as parents adopt new reading habits for themselves on electronic devices, the data show that print books remain important when it comes to their children…. 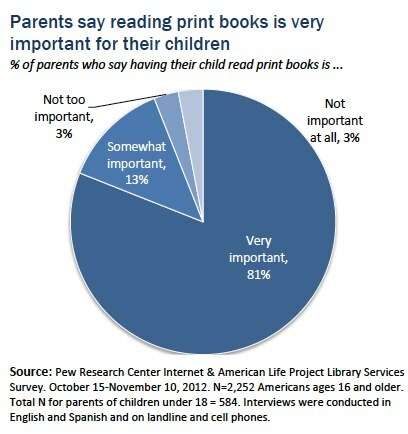 When it comes to sharing books or reading with a child, most Americans adults (not just parents) who have read both print and e-books think that print books are the better option. This entry was posted in Books, Digitization, ebooks, Reading. Bookmark the permalink.